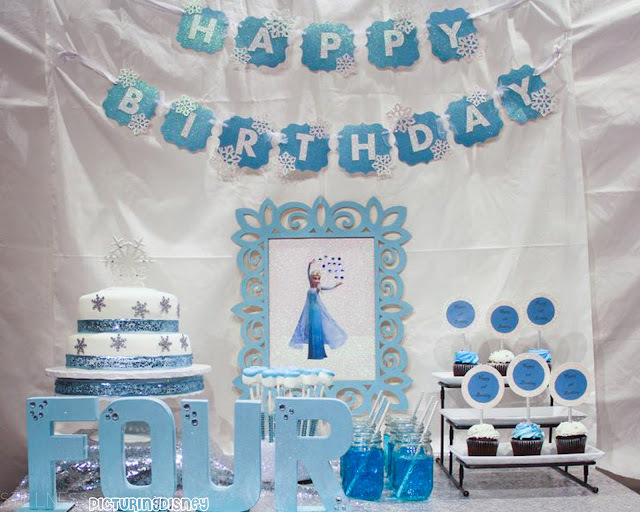 Picturing Disney: Frozen Birthday Trifecta! 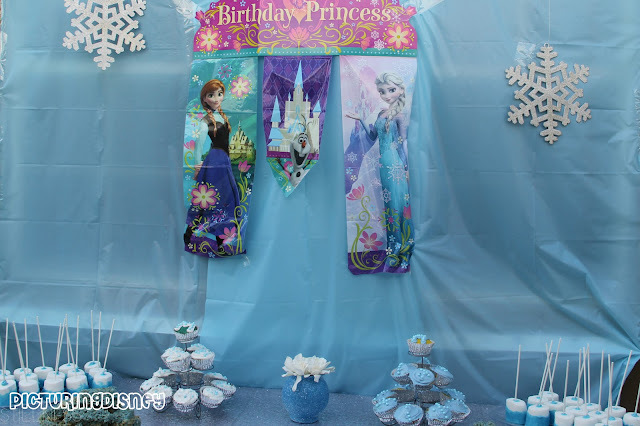 I can't contain myself from spilling the snow on Frozen birthday parties galore! Over the past three months I have had a major case of Frozen Fever. . . 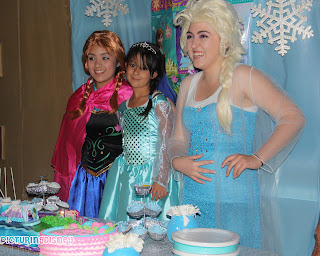 I've had the pleasure of being part of not one, not two, but THREE frozen birthday parties! The first party was a fourth birthday for Princess Annie! 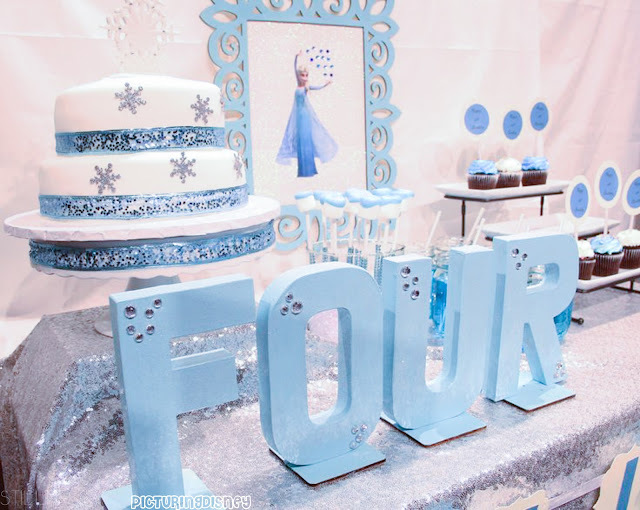 -The first thing we made were these letters that spelled out "FOUR". After a light primer, we painted them a frosty blue paint as an homage to Elsa's cape. 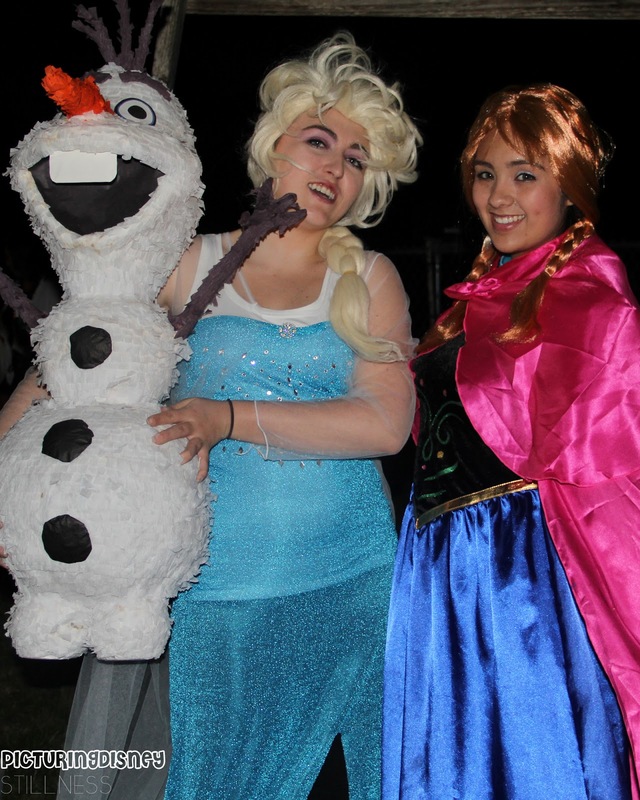 We threw in some rhinestone bling for a little ice queen flair. -Next we made some birthday banners! 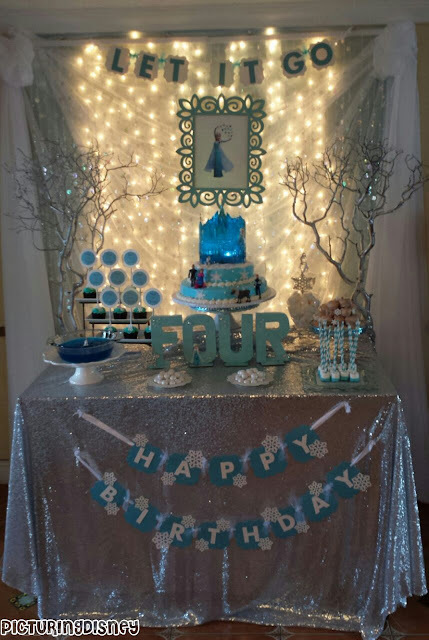 For this project you'll need: white & blue card stock glitter paper, blue and white tulle, white ribbon, a hot glue gun and either a di-cut machine or some good ol' fashioned patience. First things first, you make your shapes out of your preferred paper. Then you make your letters out of the second paper (spelling out whatever you please) hot glue the letters to the shape and connect them all with tulle and ribbon. Snowflakes? Not necessary, but they do add a cute effect. 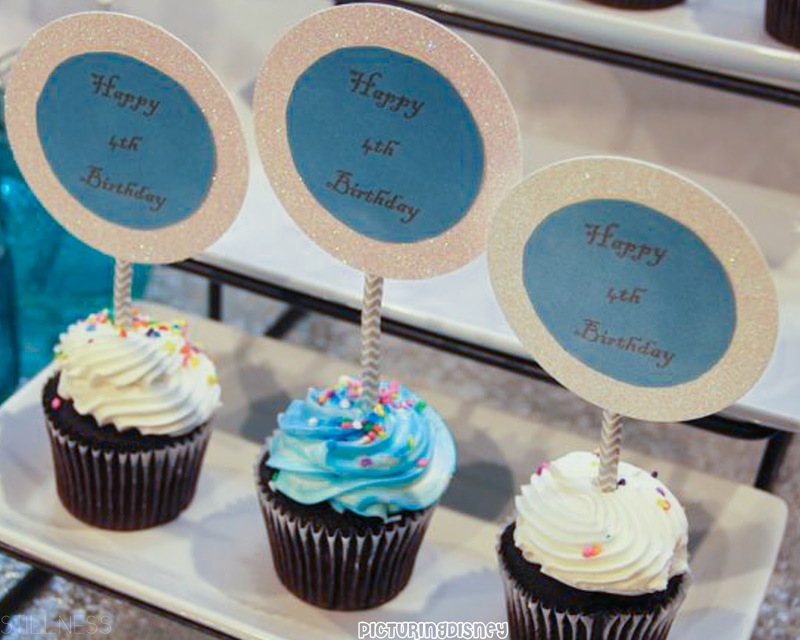 -Cupcake toppers are cute, fun and add a nice touch! Using decorative paper straws, with left over paper from the banner project and a simple print out on blue paper. 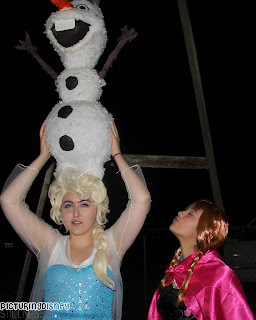 Shape 'em as you wish, glue, then stick. 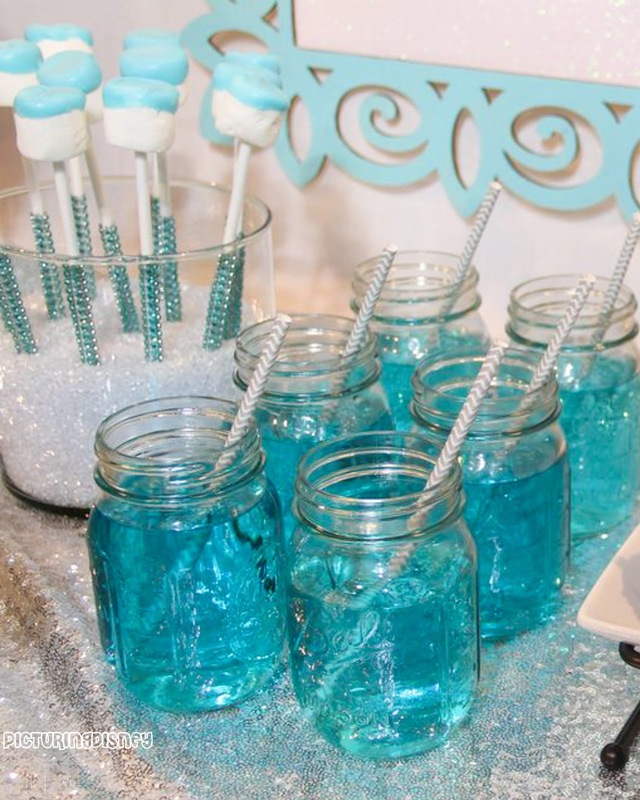 To complete our party table we made blue-chocolate dipped marshmallows and icy blue punch in clear mason jars. Princess Meli's party included a few surprise guests! 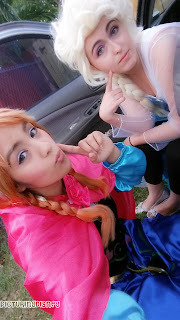 Just a quick F.Y.I. . . when ordering decorations from Ebay, it's in your best interest to quadruple check the measurements of the grand background display . . .
(lor risk disaster on set-up day.) Either way! Make the best of the situation, because I can guarantee - the kids'll love it regardless. You will need a round vase , some frosty blue spray paint, and white glitter. 1) Spray paint vase, opening down. Spray light and take the cans advice! (You don't want drippy vases. 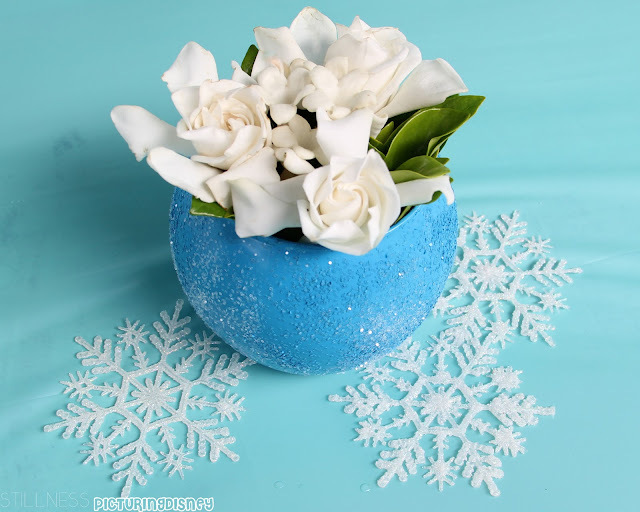 2) Before the paint dries, sprinkle glitter around the vase. The paint doubles as an adhesive. 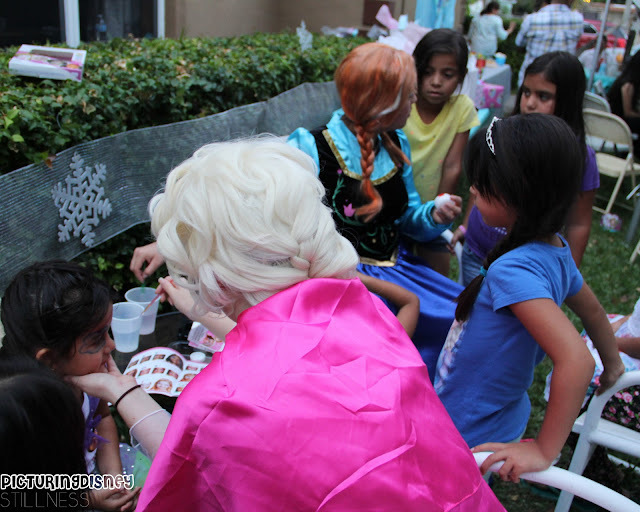 BONUS TIP: for perfectionists who hate glitter going everywhere - seal it! My favorite detail at this birthday party was the clever use of mesh ribbon along the center of the hedges. 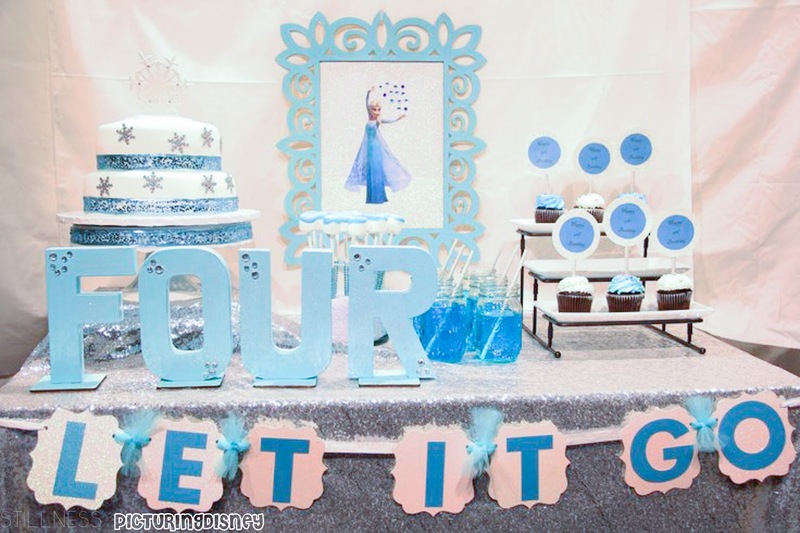 Adorned with giant snowflakes, the ribbon added a nice flair to the greenery. 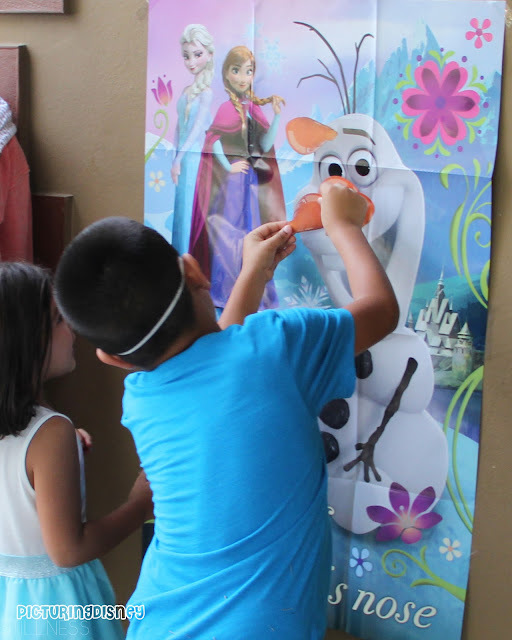 And of course- what is a party without some "Pin the NOSE on OLAF" action! Check out the Olaf Piñata! 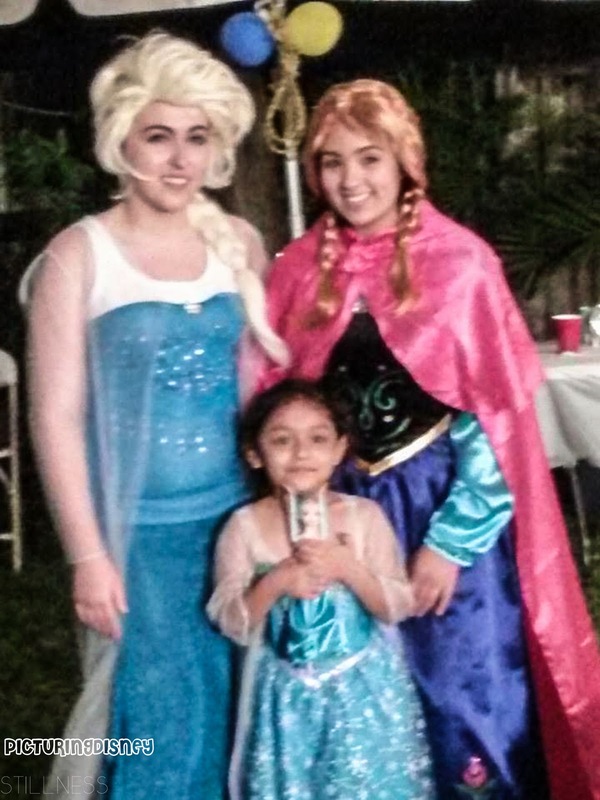 Apparently there was an Elsa one too, but the birthday girl decided no one was allowed to "hurt" Elsa. 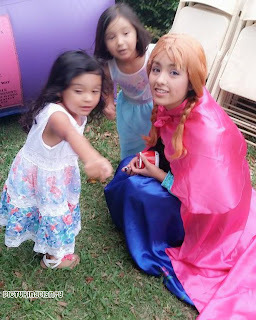 But don't worry, she doesn't have a grudge against Olaf; she explained to us "Olaf is made of snow, if he gets broken we can squish him back to healthy." Princess Dana was surprised by her favorite Disney Princesses. Dana didn't know Anna and Elsa were going to her party. 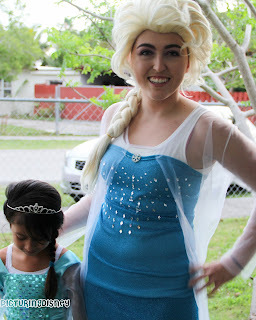 I thought her jaw would just about hit the floor when she saw the snowy blonde hair turn the corner.